Preheat oven to 350°. Spray a 13x9-inch pan with cooking spray. Set aside. Heat the olive oil in a medium-sized skillet over medium high heat. Add in the red pepper flakes, garlic and onion, and cook until just translucent and fragrant, about 3 minutes. Add in the mushrooms, season with salt and pepper, and cook until the mushrooms are tender and they have released all of their moisture (the pan should look dry). Add in the spinach, and cook just until the spinach is warmed through, about 2 minutes. Transfer mixture to a paper towel-covered plate, top with additional paper towels and press down to absorb any extra moisture. Spread the spinach mixture in one layer in the prepared baking sheet. Sprinkle the feta on top. In a large glass measuring cup, whisk the eggs until light and frothy. Pour over the spinach mixture evenly. Bake in preheated oven for 10-12 minutes or until the egg is completely set. When the baking pan is cool enough to touch, run a knife along the sides, and then invert onto a cutting board. Cut into six equal-size egg patties. To assemble the sandwiches: Top the bottom half of an English muffin with an egg patty, a sausage patty, and a slice of Swiss cheese. Top with other half of the English muffin. To freeze: Wrap each sandwich tightly in plastic wrap, then place in a large zip-top freezer bag. Freeze for up to six weeks. To reheat: Unwrap from plastic wrap, then wrap in a paper towel, microwave at 70% power for 2-3 minutes, or until the sandwich is heated through. To make sure your sandwiches don’t get soggy, try freezing all the components separately, then assembling. 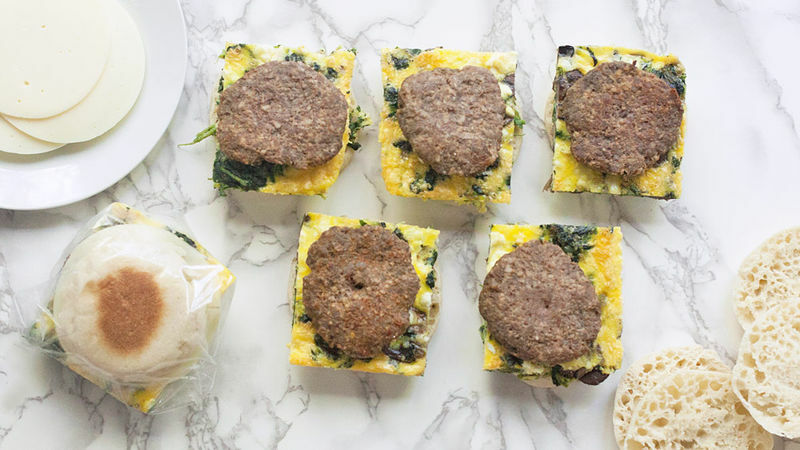 Freeze the English muffins, freeze the sausage patties, and freeze the egg patties. Then, working quickly, assemble the sandwiches and get them back in the freezer. Power varies by microwave; you might have to do a little bit of experimenting to get the right time to reheat your sandwich. Don’t have a microwave? Defrost sandwich in the fridge overnight, and then heat in a 350°F oven for 10-15 minutes, or until heated through. You’ll feel like such an adult every time you reach into the freezer for one of these microwaveable breakfast sandwiches that you prepped over the weekend. Way to go, you. Breakfast is the most important meal of the day. Cliché? Yep. Clever marketing? Probably. True? Most definitely. But, let’s be real here, who has time to worry about that when you slept through your alarm, the car won’t start and you have the world’s biggest presentation at 9 a.m.? You’re too busy for a good breakfast, right? You’ll eat at lunch. Except no. Because you’re awesome, and you took a few minutes out of your busy binge-watching schedule last Saturday and make a batch of these heat-and-eat, grab-and-go breakfast sandwiches. Your breakfast is happily heating up in the microwave while you try to find a pair of matching socks. Gosh, you are so on top of things. You’re going to make these babies assembly line-style, so you’ll want to make sure to have all your ingredients before you start. Don’t forget to grab some plastic wrap and zip-top freezer bags, too. First up, start with making the egg patties. In a large skillet, heat a drizzle of olive oil over medium high heat. Add in some crushed red pepper flakes, minced garlic, and onions. Once those are nice and tender, add in the mushrooms, and cook until they have released all their moisture. Next up, add the defrosted and squeezed dry spinach. Cook just to release any extra moisture—about two minutes. This step is really important to keep your sandwiches from going soggy. Line a plate with a thick layer of paper towels, and spoon the veggies from the skillet onto the plate. Top with another layer of paper towels, and really press down to remove excess moisture. Who likes a soggy breakfast sandwich? No one, that’s who. Preheat the oven to 350°. Then, spray a quarter sheet pan (also known as a 9x13-inch pan) liberally with cooking spray (really liberally), and then put the spinach mixture into it in one layer. Sprinkle the feta on top. In a big glass measuring cup, whisk the eggs until they are light and frothy. Pour over top of the spinach mixture evenly. Once the eggs are finished cooking and the pan is cool enough to touch, run a knife along the edge of the egg to break it away from the pan. Then place a large cutting board over top of the baking sheet, then flip the whole thing over to release the eggs. Using a sharp knife, cut the eggs into six squares. As an extra layer of soggy-protection, you’ll want to freeze each of the elements separately before assembly. This isn’t 100% necessary, but it really does keep the sandwich tasting fresh even out of the freezer. Split and freeze the English muffins. Freeze the egg patties solid. Cook and freeze the sausage patties. Once everything is frozen, it’s time to make your sandwiches! Working quickly, take the bottom of an English muffin, top it with one of the cooked egg patties, then one of the cooked sausage patties, then a slice of Swiss cheese. Finish it off with the top of the English muffin. Wrap each breakfast sandwich tightly in a piece of plastic wrap, and then place in a gallon-size zip-top freezer bag. To reheat: Remove the sandwich from the plastic wrap, and then wrap in paper towel. Microwave at 70% power for 2-3 minutes, or until the cheese is melted and the sandwich is heated through. Keep in mind that microwaves vary in power, so you might need to experiment a bit to land on the right time/power combo. Enjoy!